Yesterday I saw the van Gogh exhibit at MoMa (when I COULD see it, behind many heads of many tall people blocking my view of Starry Night. Happily, my favorite was the more visible Also Ran, called The Starry Night over the Rhone. Well, van Gogh's backstory of course included his appreciation for Absinthe and his prolific painting and/or his psychosis may have been that fueled in part by the Green Menace, which the liquor came to be called some time after its 1792 origins. But I'm deferring to the pros at the Virtual Absinthe Museum site who say hogwash. "Van Gogh certainly drank excessive amounts of absinthe, and he did suffer from mental deterioration - however, the one does not necessarily follow the other. Van Gogh's family had a history of mental illness, and van Gogh not only drank absinthe, but also turpentine on several occasions (it's interesting to note that thujone, the active ingredient in wormwood, is a terpene)...."
A few years ago I read a good Wired article about a scientist who wanted to get to the bottom of the Green Menace and set out to prove that it wasn't poisonous by recreating the original absinthe recipe from his lab -- at Environmental Analytical Solutions Inc., where he NORMALLY tests for pollution in water. (See? That's one eco-tie-in.) In that article they quote Johnny Depp, who compared its effects to marijuana. "Drink too much," he said, "and you suddenly realize why Van Gogh cut off his ear." 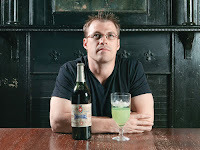 In 2005 when that article was published, Absinthe was still outlawed. In 2007 all bets were off because the FDA cleared the Great Green Way so the underground hipsters, like Johnny, have made their way out with the wormwood. But despite my passion for all things green, I haven't tried the Menace version of it yet, though I have had a cocktail or two in the New Orleans bar called L'Absinthe. Anyway, to bring this around, I'm thinking just coincidentally to the exhibit at MoMa?, there was a great article in the Times about Absinthe, and the aspirational affectations of its drinkers.Now, many have argued (like Time Magazine) that we graduated from the Age of Irony when the Towers came down. "The ironists, seeing through everything, made it difficult for anyone to see anything. The consequence of thinking that nothing is real — apart from prancing around in an air of vain stupidity — is that one will not know the difference between a joke and a menace." "just how quickly something that was once illicit...can lose its sheen of mystery and become, well, rather uncool. Once the naughty aura of the forbidden fruit is removed, all that remains is a grasp at unearned sophistication. If absinthe were a band, it would be Interpol, third-hand piffle masquerading as transgressive pop culture. If absinthe were sneakers, it would be a pair of laceless Chuck Taylors designed by John Varvatos for Converse. If it were facial hair, it would be the soul patch. 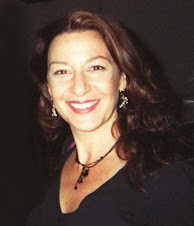 If absinthe were a finish on kitchen and bath fixtures, it would be brushed nickel." "As with rolling one’s own cigarettes, say, or key parties, partaking of absinthe is built on preparation rituals and anticipation. 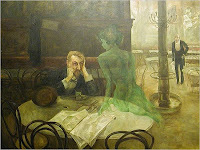 You could say that absinthe is a kindred spirit of so many falsely subversive things: ear piercing for men, tattoos on women, those cigar bars, pole-dancing-aerobics classes, mind erasers, blogging about one’s bikini grooming, naming one’s bong after a cartoon character." I have been to a cigar bar, and I LIKE the look of brushed nickel, but ironically, this blog has been bikini-grooming free. PS: Know what else is called the Green Menace? Last year Governor Blagojevich announced an "Emerald Ash Borer Awareness Week" for the State of Illinois. I'm talking about the beetle from Asia not the Governor, though I wonder what Konigberg would say about him. But to add another shot of eco to the topic, FYI the Emerald Ash Borer could destroy all ash trees in a few years if not contained. It has already killed about 20million ash trees in Michigan. That's the problem with accidental introduction of non-indigineous species. But that is a blog for a more serious day.